Let the captain and crew of the Total Package lead you on an exhilarating tour of the harbor and reefs around Nassau. This 72-foot catamaran offers you a comfortable and spacious platform from which to see Nassaus picturesque harbor and from which to plunge into the clear blue water for some world-class snorkeling. Round out your trip with a visit to a pristine white-sand beach for more swimming and relaxation in the Caribbean sun. The tour begins as you depart the dock and cruise through historic Nassau Harbor. A guide will provide fascinating information about the past and present of this important Caribbean port. Once you reach the snorkeling site, you will receive instructions to make sure you have a comfortable and safe snorkeling experience. All the necessary equipment is provided for you so that you can fully enjoy your time in the water. 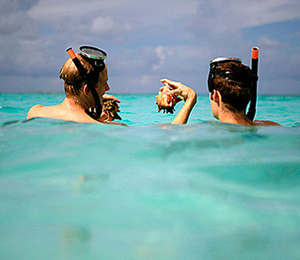 Be dazzled by the underwater world teeming with aquatic life just off the coast of New Providence Island. The wealth of coral species and tropical fish thriving in the clear blue waters of the Bahamas will enhance your appreciation of this wonderful region of the world. After exploring the coral reef, the crew will serve you a fantastic lunch and bring you to a picture perfect beach for some more island fun. Swim in the crystalline water or sunbathe on the pearly white sand as you absorb the tropical island beauty around you. You, your family, and your friends can even engage in some fun beach sports as you conclude your day of fun. This tour is the perfect way to discover the incredible underwater ecosystems and carefree way of life in the Bahamas. Make your visit to Nassau special with this comprehensive snorkeling and sightseeing trip in the waters off New Providence Island.